In this episode of Ludo à la Maison, the L.A. chef demonstrates one of his classic LudoBites dishes. Start with the marinade, combining soy sauce, sesame and chili oils, and microplaned garlic and ginger in a large bowl. Break down your bird—Ludo uses thighs, drumsticks, and halved chicken breasts—and submerge in the marinade for at least an hour, but not longer than overnight. While the meat marinates, start on your sauce—Ludo’s version of a sweet-and-sour ketchup that uses preserved piquillo peppers. “A little bit spicy, a little bit sweet, a lot of vinegar,” he says. “I love vinegar.” This time, Ludo opts for raspberry vinegar, mixing it with regular white sugar, canned piquillo peppers and Tabasco in a saucepan on high heat. Once the mixture comes to a boil, he brings the heat down to a slow simmer for an hour or so. When the sauce is sufficiently syrupy, he purees in a blender until smooth before moving it back to the pot for a final simmer. “Time to fry our bird,” says Ludo. 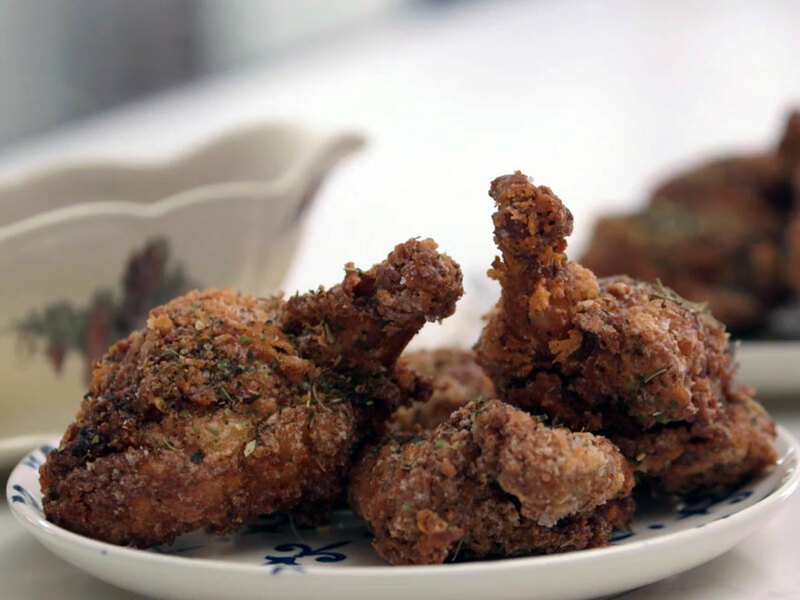 “Fried chicken is something I love to do. I never get bored cooking fried chicken. Never.” Heat your duck fat to 350F while preparing a corn starch dredge. “We don’t do buttermilk or flour, no” says Ludo. “Just corn starch,” which gives an added flaky crunch. Make sure to let most of the liquid run off each piece of chicken—if it’s too wet, you’ll have a sticky corn starch situation—and then cover it in a healthy layer of coating.